In less than four weeks, the United States will have a new president. The person whose hand will be on the Bible and taking the Oath of Office is a person who, days before Election day, had a two percent chance of winning. After Election day was over, the results were not anything many pundits expected. They shook their heads in disbelief and struggled to grapple with the outcome. But this article is not a reflection of how Donald J. Trump snatched victory from the jaws of defeat. Instead, it is a look at where the Democratic Party went so wrong. There is a term that floats around every four years when it comes to Presidential politics. The term is “kitchen table politics.” It is a term that refers to the most basic of issues that face voters when they head to the polls. When pundits say that voters generally vote with their wallet, they are only partially correct. The term “kitchen table politics” can refer to several issues that face Americans: the economy, job stability, health insurance, college education, savings, retirement, and others. Quite simply, they are the issues that families discuss on a daily basis sitting around the kitchen table. These are the hallmarks and cornerstones of many Americans’ lives. When push comes to shove, voters will most likely gravitate towards the candidate who offers up solutions to problems in any of those areas. Below is a chart showing issues that effected voters in the 2016 Presidential election. As you can see, economy is the number one issues for voters in 2016. Now compare this to the infamous line from the Ragin’ Cajun James Carville who once told President Bill Clinton’s campaign staff, “It’s the economy, stupid.” Carville had nailed the number one issue on the head, and this issue usually ranks on the top of surveys election to election. This year, foreign policy and terrorism made their way up the list. No doubt in part due to domestic terrorism events, such as the shooting in San Bernardino, the Boston Marathon bombing, and most recently the New York/New Jersey attempted bombings. After security, you see social security and education, two issues affecting kitchen table politics. Now, the Democratic Party had their own internal polling, and they had their own group of pollsters who looked at the tea leaves and discerned what was important to the American voter. Secretary Clinton’s message was devoid of much substance on top issues. As mentioned above, President Bill Clinton won his way to the presidency on these kitchen table politics. His focus on being a moderate-left Democrat who focused on cutting taxes for all and improving the economy helped him win two terms as President. In 2008, then-Senator Obama took the same approach, positioning himself as a center-left Democrat who was interested in creating what he described as “middle out economics.” This is where every day Americans would benefit from lower taxes and more job opportunities. In 2016, it was hard to determine Secretary Clinton’s economic message. Both Presidents Clinton and Obama had signature proposals that aroused the base and independents. Secretary Clinton’s economic message was, “If you like President Obama’s economy, you will get to keep his economy if you vote for me.” This was hardly a novel or uplifting message. Treating your economic message as a layup rather than a three-point shot put Secretary Clinton at a disadvantage out of the gate. The truth is, President Obama’s economy is not one that you should hang your hat on when running for President, where manufacturing is at a historic low, more than forty percent of millennials are living at home with their parents, food stamp users have doubled, the GDP has remained anemic at one percent or lower for eight years, and it has been reported that almost ninety-seven million people are out of the workforce. But how about Senator Sander’s message? Senator Sanders influenced Secretary Clinton’s message only because she was forced to recognize the sheer volume and energy of the Sanders movement. To appease the Sanders’s voters, Clinton was pushed farther left on the economy, proposing more taxes on the wealthy to pay for government programs. The result was a candidate who had to both position herself as a center-left Democrat who could win the moderate wing of her Party, while also espouse socialist ideals to help placate the Sanders’s wing of the Party. In the end, the message rang true to very little as many were tired of low growth and sought change. Devoid of any substance or sizzle, the economic message for Secretary Clinton was a weakness rather than a hindrance, and it showed. In an IBD/TIPP Poll compiled days before the election, Donald Trump was viewed as the candidate to better handle the economy than Secretary Clinton by a margin of seven points. While many blamed Secretary Clinton’s loss on her lack of focus on the Rust Belt, it may not have helped in the end. Without a message and a public perception that Clinton could handle the economy, she had already lost the top issue that mattered most to American voters. 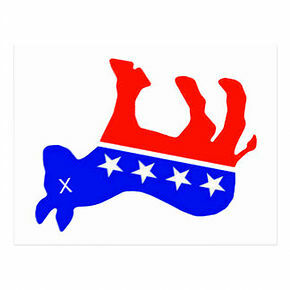 The Democratic Party did not just lose the Presidential election, they have been losing power in government all over the country. During President Obama’s term, more than 1,000 Democrats have lost their seat either in state legislatures, congressional seats, and governorships. Keep in mind as America heads for another consensus, without Democratic governors to veto new districts, Democrats are poised to endure more ground level losses due to gerrymandering. South Carolina State Senator Vincent Sheheen described the feeling in local politics by saying voters have been “punishing Democrats for eight solid years – it’s been exhausting.” Everything comes back to national politics and President Obama. As the man who has set the tone for his party, his tone was not one that helped down ticket candidates. The irony being that during the election, many pundits thought that Donald Trump would hunt down ticket candidates for the Republican party. The opposite happened. The Republicans have taken over the House, the Senate, and are poised to set up the Supreme Court as a conservative court for decades to come. That is what they call a “clean sweep” in politics. But why the onslaught of losses? It all comes back to the issue of “kitchen table politics.” If the Democratic Party continues to focus national attention on social issues and not issues that affect everyday Americans, they are doomed to wander in the political wilderness for years to come. Factor in the potential for a successful Donald Trump presidency where Mr. Trump delivers on reviving the economy and bringing back millions of jobs, and you are looking at eight years of possible Republican dominance. While there is no excuse for Secretary Clinton being a weak candidate, the bottom line is Secretary Clinton was most likely doomed for defeat since the day she won the nomination. Without a clear message relating to personal economics, security, and other “kitchen table” issues, Secretary Clinton had a long uphill climb to win the Presidency. Contrast that with Mr. Trump’s pro-economic, pro-security message, and it is of little wonder why the Rust Belt broke from Democratic ranks and went Republican for the first time in thirty years. The Democrats have a long way to go after their 2016 loss. Mr. Trump’s new “big tent” Republican party that focuses on the economy and strength rather than transgender bathrooms could set the party up for a new generation of Republican voters. In 2008, many said the election of Senator Obama was the death knell for the Republican Party. It is turning out that his election may have been a hail Mary for progressive politics, and Mr. Trump was there to intercept in the end zone.